Home / Projects / Making the World’s Best Grill Grate! Cheap – If your grill has a grate made of super thin wires that’s so lightweight you can carry it with your pinky, you’ve got the worst kind. These cheap grates are so thin they can’t absorb or retain any real heat. That means they won’t sear meat, and they require your grill to work overtime. It’s impossible to really get fantastic results with a cheap grate. Mediocre – Some grills come with lightweight cast iron (sometimes ceramic coated) grates. The nice thing about cast iron, as opposed to thin wires, is that it will retain more heat. But the amount of iron used in these grates is only marginally better. Add to that the fact cast iron is extremely rough, and you end up with food sticking to the surface. 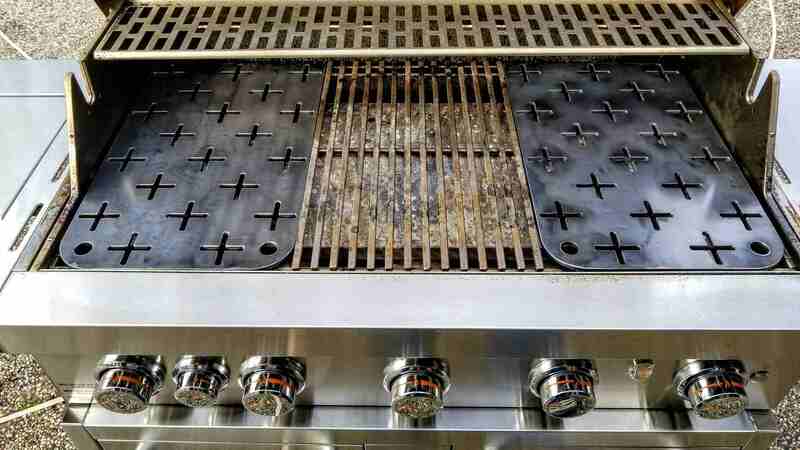 OK – Higher end grills will sometimes come with heavier stainless steel wire grates. The thickest I’ve seen are about 1/4″ thick, with each grate section being considerably heftier than the cheap versions. Generally speaking, stainless steel has the same specific heat capacity as cast iron, but with the added benefit of being smooth so food doesn’t stick to the grate. The mass of the cooking surface. First, for material selection you do NOT want to choose Aluminum. It takes a lot of energy to heat up Aluminum, and it doesn’t retain the heat at all, which is why Aluminum is used as a heat sink. Skip those pricy aluminum grates being sold online. I tried them. They are crap. Don’t waste your money! Iron must be cast into molds, and is imprecise and rough. Stainless steel costs considerably more than mild steel. However, the heat from the grilling process, combined with the continuous baked / burned on food quickly renders the benefits of the extra cost meaningless. Steel offers excellent thermal properties combined with reasonable cost between that of iron and stainless. The one drawback is that steel can rust like iron, however it only requires occasional seasoning with oil to mitigate this downside. Shaping the World’s Greatest Grate! If you’re rethinking the lowly grate, it’s worth considering the shape of outside dimensions of the material as well as the actual grilling surface. Some people think you need a bunch of bars for the meat to sit on to give it flavor, but that’s just wrong. The best steakhouses in the world grill meat in a pan! The reason grills come with those crappy wire grates is 100% because they’re cheap! There is some benefit to having a few openings as opposed to cooking everything in a pan. When the grate has holes, it allows fats, marinades and other juices to drip down so the food isn’t “boiling”. But the trick is to have just enough openings in a heavy steel surface to still retail as much heat as possible, while allowing liquid to drop down, and smoke to rise up and flavor the food! OH! And while we’re at it, we might as well make things a little easier when it comes time to actually move the grates around. So how about rounding out the corners and maybe adding a couple of holes you can get a finger or utensil in? After thinking through all of these issues, and testing numerous designs, this was the one I settled on. We start with 3/16″ thick plate steel, weighing in at 7.5 pounds per square foot! Since we’re working with steel these grates can be cut on a CNC machine. Here’s the entire process in 2.5 minutes. After being cut, each grate needs some grinding and finishing, and then finally it needs to be placed in the grill, oiled and seasoned! As you can see, these grates are radically different than the ones grills come with. They are cut from 3/16″ steel plate, and retain a LOT of heat. So they are amazing at searing meat – and equally amazing at grilling veggies or other small-ish items since they won’t fall through the grates! We’re going to make several different variants to fit just about any grill. If you’re interested in one or more for a particular application contact us and we’ll do a specific variant for your exact fit!